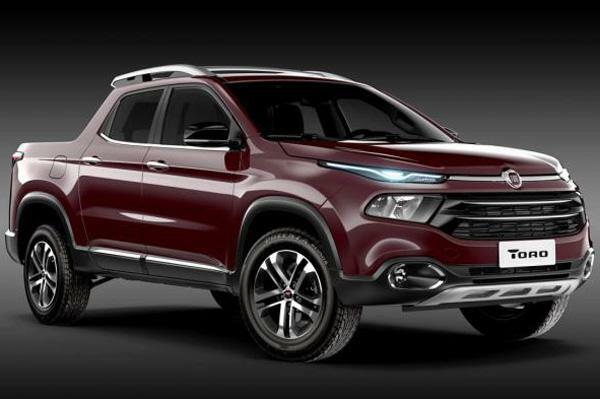 Italian automaker, Fiat has revealed its first ever ladder-on-frame, Fiat Toro pick-up. Even before revealing the Toro officially, the teasers and spy images were making rounds on internet. Toro means bull in Italian. This new Fiat pick-up is a huge departure from the traditionally cute-looking cars for which the Fiat is famous for. Known as ‘Sports Utility Pick-up’, this double cab, luxury 5-seater measures 4,915 mm in length that comes with a payload capacity of 1,000 kgs. The double front-fascia design of Toro is quite debatable in terms of likeability. Fiat Toro has been designed primarily for Latin American market. The engine options for Fiat Toro includes a bi-fuel 138bhp, 1.8-litre ethanol/petrol engine as well as a 170bhp, 2.0-litre Multijet diesel engine. The 1.8 litre petrol engine of all new Toro is mated to a 6-speed automatic transmission and the drive train being front-wheel drive, and the more mightier 2.0 multi-jet diesel engine would get a six-speed manual transmission gearbox which is available in both front-wheel (FWD) as well as all-wheel-drive (AWD) layouts. The Brazil-bound Fiat Toro which was revealed today is going to be equipped with 5 inch touchscreen display, GPS navigation, rear-view camera and Bluetooth connectivity. The other additions of Fiat Toro includes electric sunroof, xenon headlights, and the rain sensing wipers. The base models of Fiat Toro would get 16-inch wheels, while the top trim of the car would be getting much larger 18-inch wheels with an additional option of 9 speed automatic gearbox. The Pickup is expected to go on sale internationally late 2015, or early 2016. Some of the rivals of Fiat Toro are Toyota HiLux,Volkswagen Amarok and Ford Ranger in the compact pick-up truck segment.